The aim of the workshop is to train collection managers, collectors and data users in order to give them the biodiversity informatics knowledge and tools they need to start the digitalization and publication of Haïtian collections. Around 166,000 occurrences are currently published on GBIF. which does not represent well the rich biodiversity in the country. Furthermore, even if 29 countries published data about Haïti, no occurrences are directly published by Haitian institution. Haïti is part of the Caribbean biodiversity hotspot, where a high level of endemic species is observed. But biodiversity in Haïti is vulnerable due to human development, lack of clear conservation policies, and environmental threats (earthquake, hurricanes). In order to develop conservation plans and initiatives that will result in a better protection of this biologically rich area, researches and managers need to have access to species checklists and inventories of protected areas. Practically, the workshop provided an introduction to GBIF and the international Biodiversity data network, as well as training for digitalization of specimens, data-management, data cleaning software and tools, and data publication through the Integrative Publishing Toolkit developed by GBIF. An introduction to the application of biological data sharing in biodiversity analyses was also provided, in context of biodiversity questions and problematics in Haïti. During the first day, we discussed the role of GBIF and the aggregators and nodes around the world. The second part of the day was dedicated to the DarwinCore standard, and the organisation and meaning of the most useful terms. The subject of the second day was the digitalization itself, answering questions about whys and hows. We also discussed different data-management tools and how to structure a database. The third (and last) day of the general workshop was dedicated to the understanding of the utility of powerful data cleaning tools such as OpenRefine, georeferencing tools such as GeoLocate and Google Map API. A live description and demo of OpenRefine and its function give to the participants the possibility to see how this tool will help them preparing their data for the publication. Finally, a step-by-step presentation of the IPT give to the participants all the knowledge necessary to publish their data to GBIF. This final day of the workshop was aimed to the staff of the Cayes Botanic Garden, in order to discuss more precisely the structure of their database, the next steps in the project and define the protocol they will use to publish data on GBIF. We took some time to start the cleaning of the Eckman‘s herbarium dataset, in order to practice the knowledge acquire during the days before. 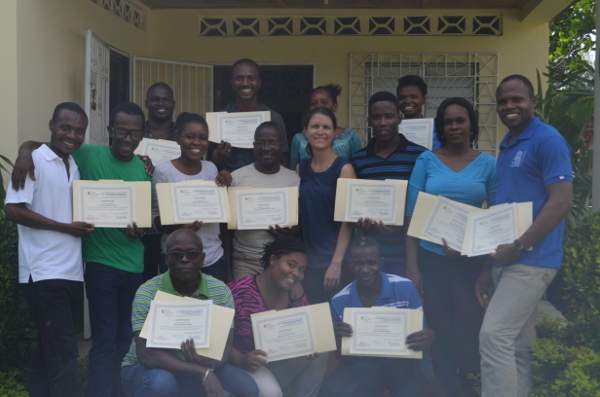 This workshop, and the small grant that permit it, are just the beginning of a more ambitious project imagined by the Haitians scientists, leaded by William Cinea, director of the Jardin Botanique des Cayes. The will to construct, on robust foundations, a curriculum on biodiversity informatics, as well as a pan-Haitian initiative to collect biological data, will allow the country to acquire tools to protect its biological richness.